Obituary for Jannette (McConneaughey) Hunter | Hairston Funeral Home, Inc.
Mrs. Jannette McConneaughey Hunter, age 81 of Salisbury, passed, May 1, 2018 at Novant Health Rowan Medical Center. She was born in Rowan County on, May 12, 1936 to the late Sylvester McConneaughey and Annie Mae Falls McConneaughey. She was a graduate of J.C. Price High School and previously worked as a nurse's aide and was a homemaker. She was a member of Lilly's Chapel Church, where she served on the usher board. She is preceded in death by her husband, James Edward Hunter, daughter; Barbara Jean Hunter, brothers; Sylvester McConneaughey, and William Odell McConneaughey and sisters; Dorothy Bryant and Francella McConneaughey. Precious memories remain with her children, James McConneaughey (Martha), Lexington, NC; Maurice Hunter (Connie), and Rodney Hunter (Lori), all of Jacksonville, Fla.; Terry Hunter (Carla), Cleveland, NC, Darryl Hunter, Salisbury, NC, and Deborah Ann Underwood (Charles), East Spencer, NC; sisters, Lila Maultsby and Dianne L. McConneaughey both of Salisbury, NC; seventeen grandchildren, twenty four great grandchildren, four great-great grandchildren; special friends, Marvin Koontz, Salisbury, NC and Lamont Blackwell, Winston-Salem, NC; sister-in-laws, Cora Lagree, Granite Quarry, NC and Janet McConneaughey, Temple Hills Maryland, and a host of nieces, nephews, other extended relatives and friends. The family will receive family and friends at 1018 S. Church St., Salisbury, NC. Service: Wednesday, May 9, 2018: Lilly's Chapel Church, 618 W. Thomas St., Salisbury, NC 28144; 704-637-6788, 11:00 visitation; 11:30 funeral. Rev. 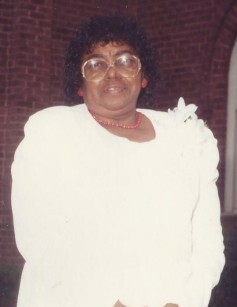 Dr. Doris Clawson, pastor/eulogist. Hairston Funeral Home, Inc., is serving the Hunter family. Online condolences may be sent to: hairstonfh.com.